Cleopatra – Did You See That One? As Rome and Egypt come together Cleopatra (Taylor) gains the favor of Julius Caesar (Harrison) and later Mark Antony (Burton). As their lives intertwine, Cleopatra begins to wield her power in an effort to preserve Egypt for herself. This film is one of the most expensive movies ever made. Adjusted for inflation, this one comes in at #15 on the list. The movie is based on the historical accounts of Caesar, Mark Antony, and Cleopatra as told by Plutarch, Suetonius, and Appian. The novel The Life and Times of Cleopatra was also used in shaping the story. The screenplay was written by the movie’s director Joseph L. Mankiewicz (All About Eve), Randall MacDougall (Mildred Pierce), Sidney Buchman (Mr. Smith Goes to Washington), and Ben Hecht (His Girl Friday). Because of Mankiewicz’s late arrival to the project, much of the film was written during principal filming, and no shooting script exists. The movie would go on to be nominated for Best Picture. The cast features some of the biggest names in Hollywood from the late fifties and early sixties. Elizabeth Taylor (Cat on a Hot Tin Roof) plays the title role. She’s joined by Rex Harrison (The Ghost and Mrs. Muir), Richard Burton (Who’s Afraid of Virginia Woolf? ), Martin Landau (North by Northwest), and Roddy McDowall (How Green Was My Valley). Hume Cronyn (Marvin’s Room) and Pamela Brown (Becket) are also featured in this one. This is an epic film in every sense of the word. The story attempts to condense decades of history into a compelling drama that runs just over four hours. (Longer or shorter depending on the version.) For the most part the story is successful in making this drama work. 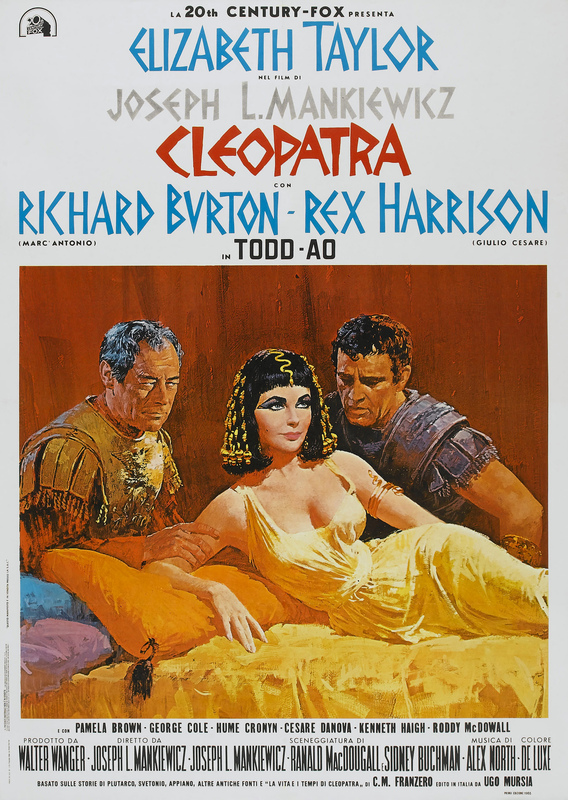 The story is driven almost entirely by Cleopatra, who connects with each of the other main characters throughout the film. The mix of romance, drama, and history all come together with a unique style that still holds up today. Unfortunately, this story is designed for a patient audience and I don’t see a film of this length finding its way into theaters any time soon. While the story is incredibly interesting, this is not a quick-moving film. It’s interesting to note that Mankiewicz initially wanted this split into two films, something that would almost definitely be done today. The acting in this movie is great. Elizabeth Taylor took on the title role with a performance that brings out the power that Cleopatra had over others. Throughout this movie Taylor plays the entire range of emotions perfectly. She’s joined by Rex Harrison, another great actor, who gives a great performance of his own. He would eventually earn a nomination for Best Actor for his portrayal of Caesar. Like Taylor, he was asked to bring out a lot of conflict and emotion from his character and he does great work with it. Richard Burton is another great talent in this movie. His role asked for a dramatic portrayal of a man on the edge of losing everything. In addition to the emotion, he was also asked to bring out the flaws in his character. Like Taylor and Harrison, he did a great job. Martin Landau, Roddy McDowall, Hume Cronyn, and Pamela Brown are also great additions to the cast of this movie. Each of the historical figures and fictional characters is unique and colorfully written. These stars just took that writing and brought it to life with great skill. The hundred of performers also featured in this movie all do nice work with the challenging production. The visuals in this movie bring the epic nature of this story to life. The sets were built twice, once in London and later in Rome when production was moved. This is part of the overblown budget behind this film, but it’s also why things look so good. The set design and costumes are all a unique version of ancient life. Elizabeth Taylor was one of the major winners when it comes to the costume work on this movie. She looks incredible throughout the film as her character is featured in an array of wonderful costumes. The film won Oscars for Best Set Decoration, Best Costume Design (Color), Best Cinematography, and Best Visual Effects. The film was also nominated for Best Editing. In addition to the visuals, the film was also recognized for sound work. The movie earned Academy Award nominations for Best Sound and Best Score. From all of the technical aspects this movie turned out really great. This is even more impressive considering the many production issues that threatened the completion of this movie. This film is the result of a 44 million dollar production budget that overran estimates and nearly bankrupted Fox. At the time, this was considered a box office failure, coming in at a loss upon the initial release. After being released a second time, the film recovered financially and became one of the classic epic films of Hollywood. The production was troubled by relocations, recasting, and a medical emergency that nearly killed Elizabeth Taylor. In addition, Taylor and Burton began an affair during filming that brought an enormous amount of negative publicity to the movie. Still, this movie has endured, and exists with several versions available. The original cut was close to six hours long, but today the four-hour version is the most commonly seen. There are also efforts to recover the lost footage to restore Mankiewicz’s version of this film. This is a real epic film from a great age of Hollywood. If you’re a fan of any of the main stars this is one to check out. I would also recommend this to fans of epic films like Gone with the Wind or Lawrence of Arabia. It is a really long film, so if you’re not patient, check out something else. I would also suggest this to anyone who loves the big budget films of this time period. I give this one 4.3 out of 5 stars. Pingback: Brute Force | Did You See That One?